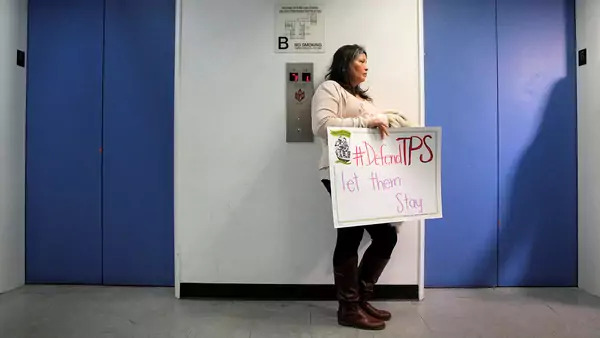 Established by the U.S. Congress in 1990, temporary protected status (TPS) provides legal status to migrants from countries that have suffered natural disasters, protracted unrest, or conflict. The program, which was first offered to Salvadorans fleeing civil war, has enjoyed support from both Democrats and Republicans for nearly three decades. It allows migrants to stay in the United States for periods of up to eighteen months, which the U.S. government can renew indefinitely. Other countries have implemented similar forms of relief: European states offered temporary protection to tens of thousands of refugees from the Balkans in the early 1990s, and Turkey offers temporary protection, including access to social services and permission to work, to millions of Syrians who have fled civil war. Several hundred thousand migrants live and work in the United States under TPS. The vast majority come from El Salvador, Haiti, and Honduras. Some 260,000 Salvadorans have been allowed to stay in the United States since devastating earthquakes in 2001. Haiti was assigned the status after its 2010 quake, and Honduras, along with Nicaragua, was offered it after a 1998 hurricane. In all, ten countries have the designation, though six of them are scheduled to lose it in the coming months. Half of the ten have been TPS countries for more than a decade. The Department of Homeland Security (DHS) can renew a country’s designation if it believes conditions there remain unsafe. President Donald J. Trump issued several executive orders in his first year aimed at boosting immigration enforcement and border security. One of them sought to end an Obama-era program known as DACA, which protected from deportation undocumented immigrants brought to the United States as children, though the program remains in place pending litigation. In late 2017, the Trump administration terminated the TPS designations for Sudan, Nicaragua, and Haiti. In January 2018, the administration terminated the designation for El Salvador, where more than half of all TPS holders are from, and in April, it ended TPS for Nepal and Honduras. The administration claimed that these countries had sufficiently recovered for migrants to safely return, giving them between twelve and eighteen months to remain in the United States and plan for their repatriation. Migrants whose countries’ TPS designations are set to expire have few options to remain in the United States. They may not apply for permanent residency based solely on TPS, but those whose spouses or adult children are citizens or legal residents can seek legal status to remain in the country. Congress could pass legislation to prevent TPS holders from being deported. Lawmakers from both sides of the aisle have backed bills in recent months that would offer a path to permanent residency, but such proposals have so far been unable to garner enough support. TPS holders can also look for entry into a third country. El Salvador said it was in talks with Qatar for the Gulf nation to offer temporary employment to Salvadoran nationals set to be deported from the United States, leading some analysts to raise concerns about labor conditions for migrant workers there. Some migrants say they will try to stay in the United States regardless of their legal status, despite vows by Trump to crack down on unauthorized immigrants. Many of the hundreds of thousands expected to be repatriated will face hardship. The move is likely to split up thousands of families: TPS holders are parents to at least 273,200 children with U.S. citizenship. Many of those facing deportation are averse to bringing their children to countries that they see as unsafe. El Salvador, for example, is one of the world’s most dangerous countries. It has been plagued by high levels of violence linked to criminal gangs, particularly Mara Salvatrucha, or MS-13. The vast majority of TPS holders are employed, and about one-third are homeowners in the United States. Prospects for work in their home countries are grim: the World Bank put unemployment in Haiti, the poorest country in the Americas, at 13.4 percent in 2017, and more than a third of the populations in Haiti, El Salvador, and Nicaragua are underemployed. What’s more, their removal from the United States has the potential to damage already weak economies. Remittances, a large portion of which comes from the United States, make up roughly 29 percent of Haiti’s gross domestic product (GDP). Some immigration restrictionists, however, argue that savings and skills TPS beneficiaries have acquired while in the United States can benefit origin countries. 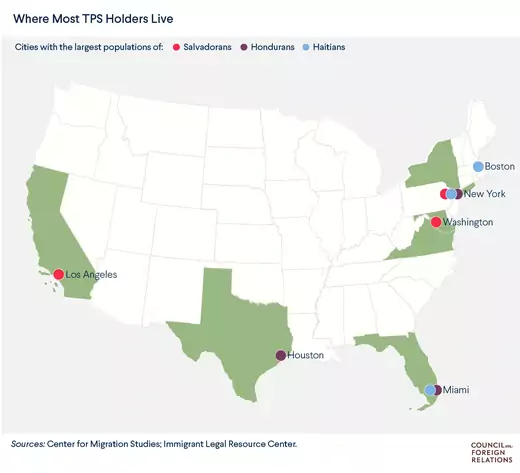 The removal of TPS holders could also be a drag on the economies of American cities with many TPS beneficiaries, such as Washington, DC, and Los Angeles, advocates say, setting employers back hundreds of millions of dollars in turnover costs. 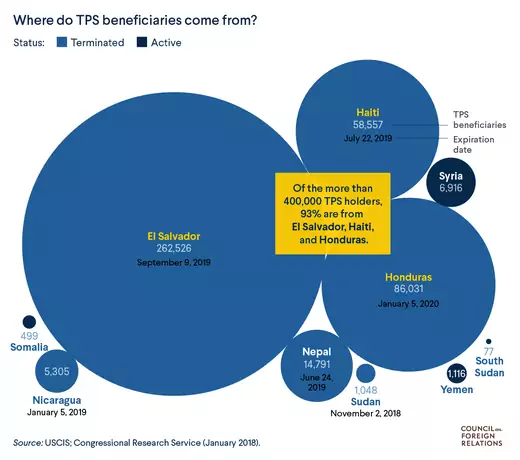 Some 88 percent of Salvadorans benefitting from TPS were in the labor force in late 2017, according to the nongovernmental Center for Migration Studies. Vox reports that nine thousand of them are employed by the U.S. government as janitors and maintenance workers in the capital.